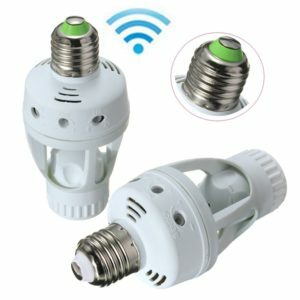 The Sensor E27 light bulb socket adapter easily converts any screw bulb socket into a fully operational sensor light simply and without the need of an electrician or custom installation, combine it with some energy saving lights and you have one optimized lighting solution. With a sound sensor, When the decibel value detected sound to the outside is greater than the set value, it will make the circuit is turned on, the lights after a period of time, the circuit is disconnected, the Sensor E27 light bulb socket adapter turn off. Light bulb sockets are the heart of Lighting Industries, without this lighting is not possible in this modern world and James Lighting is playing an important part in this field from last twenty years.